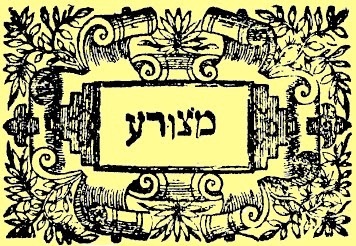 The parsha is normally read together with the previous parsha, Tzaria, on non-leap years, so please go back and read my discussion on parsha Tzaria. This parsha teaches general principles of hygiene, cleanliness, and means to formalize return to the general community for infected persons. First, for the infected person, a formal and gradual return to the community is described, with formal offerings of gratitude to G~d for healing. Next, hygiene for homes with mold is taken very seriously as a health threat, something which our modern medical standards are only beginning to realize. Third, various bodily discharges are taken as a serious threat to the general hygiene of the caregivers, family, and general community. Fourth, the normality of procreation and the realities of rest during menses are given some basic hygienic standards. It is very tempting to shift into a mode of judgement by asking “What did this person do wrong?” It can be very self satisfying to look for another person’s faults, because it takes the focus off our own feelings of inadequacy. It is further inaccurate to characterize the discussion of implementing proper hygiene as somehow discussing areas of moral impropriety and divine judgement. To make this point very clear, the section discussing conception and menses (Lev 15:16ff) clearly elevates the physical realities related to the procreation of new life to clean, normal, and appropriate life. The expectation to enter the Tabernacle is put aside to make defined and normal time and space for the blessings of raising a new generation. “Divine intervention” is always in tension with “free will” (Genesis 1-3). This discussion is never ending. My view is they are both true. Living creatures are granted free will AND G~d intervenes in super-natural ways, guiding history. The agents of change are normally outsiders. In general, people in power do not want change. Thus it is the place and prerogative of outsiders to foster change. One may be an insider in some spheres, and an outsider in other spheres. The haftorah model is the leper, the infected one, placed outside the gates of the city and a non-member of the opposing group, the Aramean people. They are outsiders of both, and trapped between. They decide to face death for the possibility of food. We see the agents of change throughout history as those outsiders who press for change against all odds. The list is endless, so I will not elaborate further. Change happens fast. In the haftorah it happens in less than a day. Riots and revolutions, wars and coups, elections and judgements, are almost all short events in human history. There is usually a time of unrest, and then a sudden break from the norm. Take some time to for meditation and introspection about this process, and the part you play in various spheres of life. Are you an outsider, insider, enemy? Do you resist good news and change? Have you experienced good change and could share your good news with other people? It seems simply being in a situation in life such that you can read this blog means you have good news in your life. There are two billion people, one third of the world population, who do not have proper food, water, shelter, medical, electric, nor transportation. There are huge issues of governance, taxation, energy and medical policy which need to be addressed by nations. There are vast areas of education and social responsibility to address. Where do you fit in? How can you participate in Tikkun Olam, the Restoration of the Universe?